​​Lord Jesus Christ, the children's friend. In loving faith, dear Lord, to You. To find in Christ their all in all. Welcome to the St. Paul Lutheran website. We are pleased that you have chosen to visit us in this manner and hope to be able to meet with you face-to-face. On August 27, 2018, we began our 124th year of operation. We have a long tradition of teaching the Scriptures faithfully and providing our students with an excellent academic education. Please feel free to visit our school. Should you be interested in learning more about us, you may email ​​​bkube@splfairmont.org or call 507-238-9492. I grew up on a farm near Alexandria, MN. ​I graduated from Concordia University in St. Paul in 1999. After having taught in Lutheran schools in Indiana, the Twin Cities, and South Dakota, my husband Scott and our two youngest children settled northeast of Truman in May 2014 on the farm site where his grandparents toiled since the 1920s. I have quickly grown to love this community, and the students and faculty here at SPL. I am so blessed to have the opportunity to share Jesus, especially to our junior high students who find themselves at an age when society really starts to test their values and faith. It's wonderful to be a part of the family at SPL. As teachers, we are blessed to assist parents in their vocations of educating their children. Our days begin, end, and center on Christ as we help the children entrusted to us learn about the world around them, their place in it, and the Lord and Savior who created all and redeems them. We grow in knowledge, faith, and service as we serve our Lord by serving each other. I was raised on a dairy farm near Athens, Wisconsin so that makes me a Cheesehead (and proud of it!). In 1981 I graduated from Concordia College in St. Paul, MN and came to teach at St. Paul Lutheran Church and School. Doug and I have two sons, Thaddeus (Tadd) and Matthew (Matt). God has blessed me with many wonderful students and parents, and I have thoroughly enjoyed my teaching career. I pray that He will continue to use me to share His Word with young people! I have greatly enjoyed teaching 4th grade for 20 years at the school I attended. Things have changed through the years, but God's love continues to shine at SPL. My wife, Chris, is a health and physical education teacher at Fairmont High School. We have twin daughters, Emily and Ashley, who also attend SPL. I enjoy all sports, hunting, fishing, and boating with my family. ​Matthew 19:14 - "Let the little children come to me and do not hinder them, for to such belongs the kingdom of heaven." I grew up in Browns Valley, MN, where my dad is a pastor. In 2009, I graduated with a degree in Elementary/Early Childhood from Concordia University, Nebraska. I taught at Trinity St. Paul in Hamel, IL for four years in a combined 1st and 2nd grade classroom setting before coming to St. Paul Lutheran School in Fairmont. Some of my interests are golf, reading, sewing, scrapbooking, and nail art. Deuteronomy 6:6-7 - And these words that I command you today shall be on your heart. You shall teach them diligently to your children, and shall talk of them when you sit in your house, and when you walk by the way, and when you lie down, and when you rise. 2 Timothy 2:16 - All Scripture is breathed out by God and profitable for teaching, for reproof, for correction, and for training in righteousness, that the man of God may be competent, equipped for every good work. Mark 10:15 - "Truly I tell you, anyone who will not receive the kingdom of God like a little child will never enter it." Newer to the St. Paul family, I am a graduate of the Lutheran elementary education program at Concordia University Wisconsin. On July 9, 2016, I married Melissa Krieser, who is a high school science teacher. In my spare time I enjoy antiquing, playing/listening to music, exploring outdoors, and creating pieces of 'salvage art' using old junk. I am excited to share with the students of St. Paul the numerous ways God reveals His love for us through music and the arts. ​1 Peter 4:10 - As each has received a gift, use it to serve one another, as good stewards of God's varied grace: whoever speaks, as one who speaks oracles of God; whoever serves, as one who serves by the strength that God supplies -- in order that in everything God may be glorified through Jesus Christ. To him belong glory and dominion forever and ever. Amen. Ecclesiastes 3:9-11 - What gain has the worker from his toil? I have seen the business that God has given to the children of man to be busy with. He has made everything beautiful in its time. Also, he has put eternity into man's heart, yet so that he cannot find out what God has done from the beginning to the end. I perceived that there is nothing better for them than to be joyful and to do good as long as they live; also that everyone should eat and drink and take pleasure in all his toil -- this is God's gift to man. Psalm 78:4 - Tell to the coming generation the glorious deeds of the Lord. Psalm 66:5 - Come and see what God has done; He is awesome in His deeds toward the children of man. ​Psalm 98:5-6 - Sing praises to the Lord with the lyre, with the lyre and the sound of melody! With trumpets and the sound of the horn make a joyful noise before the King, the Lord! 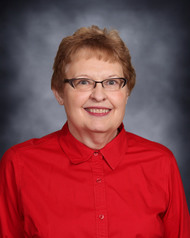 volunteer is Mrs. Elaine Lieder. I grew up in a family which practiced fiscal responsibility and Biblical stewardship. For three generations our family has taught and practiced the 10-10-80 principal. Ten percent of our income goes back to the Lord as a tithe, ten percent goes to savings for future needs and major expenses, and the remaining eighty percent takes care of our day-to-day needs. I see the Young Investors Club as a wonderful opportunity for students to practice both stewardship and responsible savings habits, since LCEF uses the funds on loan for ministry purposes.